It’s officially summer, which means it’s time to start swapping your go-to weekend denim look for casual jean shorts. Since I’ve already shared the place I swear by when it comes to shopping for skinny jeans, today I’m keeping with the denim theme and dishing where I find the best denim shorts. When updating my jean shorts collection, I keep it simple and stick to three shops that never disappoint me: Madewell, J Brand, and Free People. Keep reading to see what I like about each brand and freshen your denim shorts selection with my favorite picks from each site! 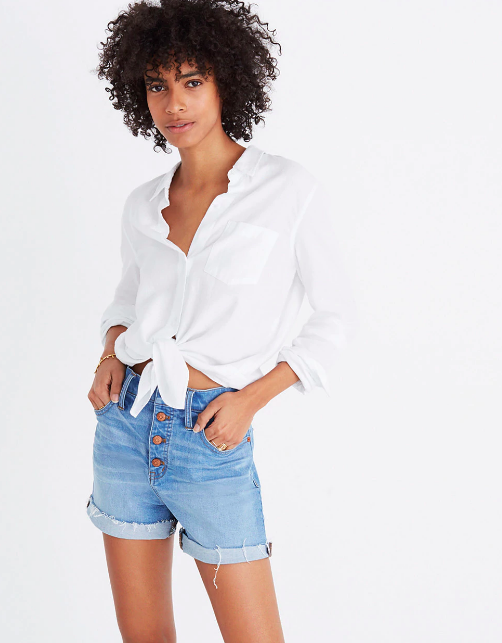 Madewell gets it right when it comes to designing a style that’s not too short and hits at the perfect hemline. I particularly like the high-rise boyshorts below. Add a statement top and you’ll be ready for any summer event. This high-rise pair is so retro. Add some color to your wardrobe with these adorable red wash shorts. I love the dark wash here. These are seriously the perfect jean shorts. Thanks, Madewell! J Brand is my go-to when I’m looking for an on-trend pair with a bit of edge. Pair these with a leather jacket for an outdoor concert venue this summer. If you’re looking for an all-white option. Such an easy pair to throw on and go out the door. This classic low-rise can be paired with oval sunnies to keep it fresh. Another white pair because who can have too many classic white jean shorts? Free People is my place to find affordable, loose options that are perfect for a lazy summer Sunday. Leave it to Levi’s to make the best-fitting jean shorts on the market. These are a staple for any beach vacay. Just like a hand-me-down, but more flattering. Add this unique pair to your favorite T-shirt-and-sandals combo for an updated look. Snag these $45 cutoffs before they sell out. Throw on your favorite band tee and you’re set. I love the idea of pairing denim shorts with a simple tee and a leather jacket. The floral side detail makes these so fresh. Wear these with classic Converse sneakers for a relaxed summer look.